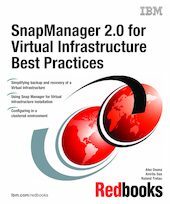 This IBM® Redbooks® publication provides best practices for the IBM System Storage N sereis and SnapManager® for Virtual Infrastructure 2.0 (SMVI). We address the resource utilization issues typically found within virtual environments by leveraging the underlying Snapshot technology, which enables you to create point-in-time copies of your virtual machines or entire data stores and then restore from these backup copies at any level of granularity, datastore, VM, disk (VMDK), or guest file, simply and quickly when required. In addition, we provide best practices for protecting the SMVI server and recovering in case of a disaster. Furthermore, we explain the seamless integration of N series storage solutions, including MetroCluster, so customers can leverage storage and virtualization technologies to create dynamic infrastructures that can create tremendous business value. The reader of this book will gain a deep understanding of how to implement SnapManager for Virtual Infrastructure in VMware vSphere environments.